Tim Weiss, our incredibly ambitious and talented director of two of the Conservatory's most lauded ensembles, the Sinfonietta and the Contemporary Music Ensemble (CME), programmed a large work at the end of this semester with CME that included an important guitar part, Songtree of Ricardo Zohn-Muldoon. 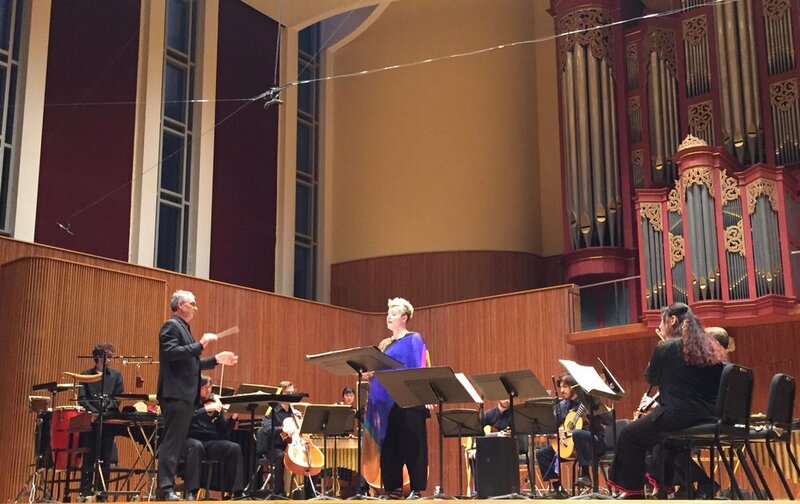 Zohn-Muldoon, a Mexican-born composer on the faculty at Eastman School of Music in Rochester, NY, had seen his music featured at Oberlin before, along with a wonderful guest appearance by Dieter Hennings. 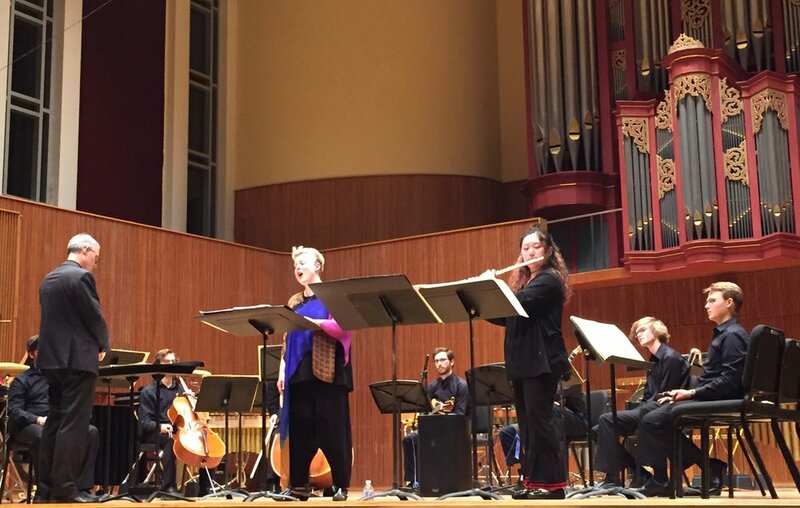 The present piece, scored for soprano, flute, oboe, clarinet, piano, percussion, violin, cello and bass, along with guitar, featured texts by both Shakespeare (in English) and Raúl Aceves (in Spanish). It was a substantial work that incorporated several segments written for smaller forces, such as a duet between soprano and violin. The guitar part had been divided between two players for this performance, allowing each of the two players a chance to participate in the project--Mohit Dubey and Brian King. The guest soprano, Tony Arnold ('90) is a fixture in the top echelons of the new music scene. 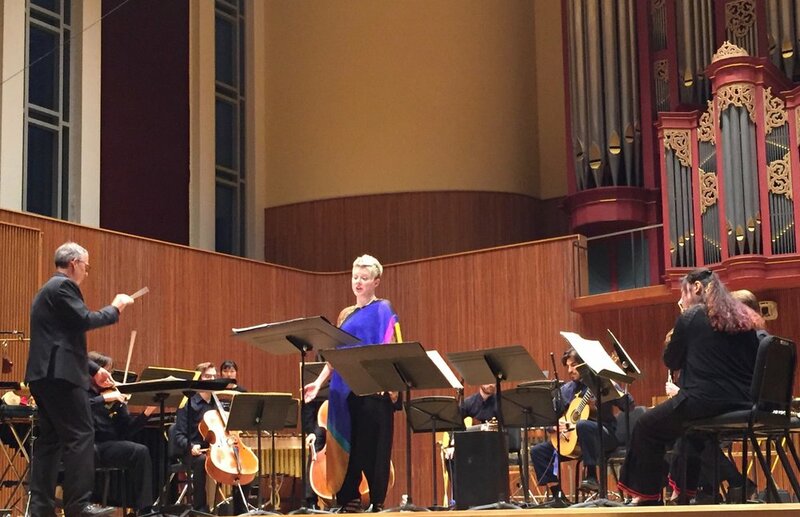 A member of ICE (International Contemporary Ensemble), she has played much with fellow Oberlin alum, guitarist Dan Lippel (and released an all-Schubert CD with him). Her performance in this concert was gorgeous, both sonically and expressively. It was easy to understand how she's achieved such success. The ensemble played brilliantly and the guitar part was clear and throughout. Other pieces on the program included the ravishing In Silence by faculty composer, Elizabeth Oganek. Taking inspiration from the solo scordatura violin works of Biber, but sounding at times influenced by the impressionists, this work painted an indelible picture, and offered Oberlin senior violinist, Liuwengi Wang, an impressive platform on which to shine. Tim Weiss conducts, Tony Arnold sings; guitarist Mohit Dubey partially visible. Tony Arnold in duet with flutist Lily Zishu Xie; guitarist Brian King seated, center. And the bows. My camera missed the composer, Ricardo Zohn-Muldoon, who came onstage for a bow as well.